The single most important factor today for the Coast Guard , are the Officers and Men who ultimately meet the challenges at sea. You could be just the man for this challenging sea- going career. If you are intelligent and bold and can think with originality and possess leadership qualities. Service in Coast Guard is not merely an employment. It is where you play the most important role of protecting the nation's interests. The life of a Coast Guard officer is a happy mix of many things; hard work, professionalism, risk and adventure and the opportunity to move around and visit different places within India and abroad. There is also the satisfaction of being involved in the nation's defence. Thus, career in the Coast Guard cannot be measured in financial terms only. Good pay and abundant perks are supplemented by a versatile career difficult to match anywhere in the civil life. Bachelor's degree with 60% marks in aggregate of a university recognised by Central/ State Govt./UGC and minimum 60% in class XII Std of 10+2+3 scheme of education with Mathematics and Physics as subjects. B.Sc with Physics & Mathematics and 55 % marks in aggregate and minimum 60% in class XII Std of 10+2+3 scheme of education. (i) A degree in Law with 8 years experiences in legal matters. (ii) Should be qualified for enrolment as an advocate in a High Court. (ii) Knowledge / Experience Assignment connected with International Law/Maritime Law. 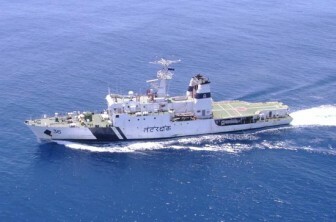 Pilot: Indian Coast Guard operates fixed-wing aircraft from shore Air stations for surveillance of the Exclusive Economic Zone. In addition, helicopters are embarked on Coast Guard Offshore Patrol Vessels to provide local surveillance and perform Search and Rescue mission at sea. Operating these aircraft at sea is challenging task and will bring your special skills to the fore. As an officer of the Pilot branch, you will have opportunity to serve both in the shore Air Stations along the coasts of India, as well as embark ships. Technical Branch: Modern ships and aircrafts are abounding with advance technology and machinery. In the Technical branch you will be responsible to keep all these equipment serviceable. You will also get opportunities to work in shore jobs in Coast Guard repair organisations. In very few other careers will you be exposed to such a wide spectrum of opportunities to keep yourself abreast of modern developments in Engineering. Your carrier will be interspersed with technical training courses up to Post Graduation level. The shortlisted candidates are called for Preliminary Selection (PSB) as per their choice of centers from Mumbai, Chennai, Kolkata, Delhi, Kochi, Vizag and Port Blair.